I shop online. In fact, I buy almost everything online. Many people feel the same: you don’t have to deal with crowds, you can easily compare prices and options, and you can do so at a time convenient for your busy schedule. What’s not to love? Take note, however, there is a big difference between shopping online and doing so successfully. Just because you are willing to pull out your credit card and make a purchase does not mean you are doing so to your advantage. I am one of those people who enjoys the online shopping experience. That being said, I have made many mistakes in the past. Fortunately, I have learned from them and am now taking full advantage of everything the internet has to offer. When I was an online-shopping newbie, I used to decide to make a purchase and then do so within a matter of minutes. While this made me feel good on the basis of time saved, there was always a chance I had left a lot of savings on the table. Comparison shopping is essential to ensure that you get the right item at the best possible price. Some sites that can help you get started include Shopzilla, PriceGrabber, Nextag, and Bizrate. I depend upon these sites for price comparison and access to customer reviews. They are now a necessary stop on the way to checkout. This is one of my favorite tricks for online shopping. It only takes a few moments to look for online coupons, and it’s really satisfying when you find what you need. And, just like the coupons at the grocery store, online coupons really help you save: just enter a code. It really is that easy. But where to find these coupon codes? Some stores offer their own codes and advertise them on their websites. Other coupons take a bit more digging to find. Some of the most popular coupon sites include RetailMeNot, CouponCabin, and CouponMom. If you search these sites before making your purchase, they will help you decide where to buy and who has the best deal. If you’re already set on a particular vendor, you can search for coupons specific to that retailer, as well. Don’t use your credit card at a site that is not 100 percent secure. If you do this, you are risking the safety of your identity and financial information. To protect yourself, only buy from stores that you know and trust. Additionally, make purchases from your home computer. When you enter your personal information into a public computer, you greatly increase the chance that your information will be stolen. 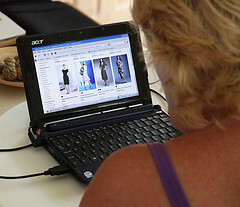 Some people are under the false impression that online prices are so low that there is no way to save additional money. Lucky for the savvy shopper, this isn’t true. In addition to coupon codes, there are other deals that help save money online. Did you know that many stores, including some of the most well-known retailers, offer free shipping if your order is more than a certain amount? Others feature buy-one-get-one deals, half-off deals, and much more. You cannot expect to find the best deal if you only check one store before buying. If the item in question is sold by more than one retailer, compare multiple stores to find the best deal. Even if all stores sell the item for an identical amount, one might offer free shipping. Great! If all other things are equal, then the the free shipping will help you save a little bit of money. This is the one thing I never wanted to do when I first started shopping online. Instead, if I had a question, I was content to leave it unanswered and hope for the best. Every online store has a customer service department to make the lives of internet shoppers easier. Do not be shy about sending an email or making a phone call before you order. Many places even offer an instant chat feature that helps you find answers fast. Hopefully this shows you that there is a big difference between shopping online and doing so with success. If you follow these five tips, you will better your chances of getting what you want, while saving money at the same time. I love #2, search for discount codes online. This can help me save a big chunk of money. I wonder why I didn’t think of this before. Great post and amazing money saving tips. Thanks JS.